The Ad-Mag was unique to Britain, and there was a kind of backdoor bravado about them in the way every Ad-Mag transmission cheekily bumped up the amount advertising per clock hour. But viewers never complained. They loved the quaint little programmes, which provided the same fascination as flipping through a mail-order catalogue. The very first Ad-Mag guide to appear was called Elizabeth Goes Shopping and it was hosted by Elizabeth Allan who would visit the more upmarket London stores of the day such as the Oxford Street based Marshall and Snelgrove (who had merged with Debenham's after the First World War but retained their name until the 1970s) and Harrods. 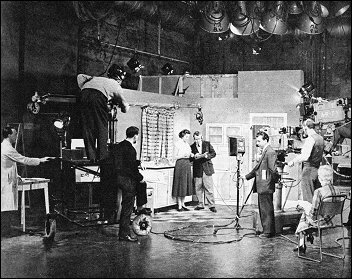 Elizabeth Allen was already well known to viewers of the BBC and advertisers were quite keen to have their products demonstrated by familiar and trusted faces and as ITV was the new kid on the block this meant gainful employment for a number of established BBC presenters such as Sylvia Peters, MacDonald Hobley and Katherine (Katie) Boyle. One other Ad-Mag presenter that was to become familiar to ITV viewers (especially children) was Muriel Young. Light entertainers such as Kenneth Horne, Richard Murdoch and Tommy Trinder were well known and well loved by the British public but where these top headliners could not be afforded, especially regionally, they were replaced by the kindly aunt or uncle type such as Jack Howarth, later to become a familiar face nationally as Jack Walker in Coronation Street. 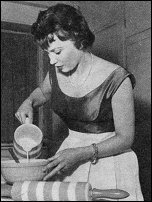 A quite different programme was Margot Lovell's Hello, Come In, which was primarily directed to the housewife and gave household hints of all kinds, both commercial and non-commercial. Margot ended up with a huge post-bag with all sorts of domestic enquiries. Some Ad-Mags were weekly, some fortnightly, some monthly: some were one-offs, for example, the Motor and Radio Shows or the Ideal Home Exhibition. But of all the Ad-Mags there was one show that reigned supreme. Jim's Inn starred Jimmy and Maggie Hanley as a couple (as indeed they were in real life) who ran a village pub in fictitious Wembleham. 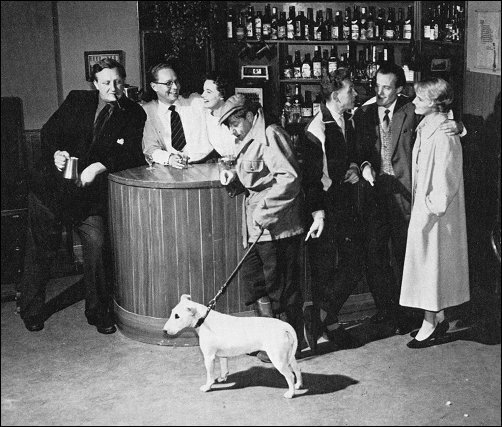 Each week customers-played by Roma Cresswell, John Sherlock, Jack Edwardes, Diane Watts, Dennis Bowen, Ken Howard and Victor Platt-would come into the pub and over a pint discuss the price and quality of a variety of domestic products. Each 15-minute episode went out live, once a week, at 10:45pm and the series became almost something of a soap opera. Director Pat Baker claimed that it was the advertising that gave the series a sense of reality: "People do talk, in a village pub, about things like household or gardening gadgets, and how much they paid for them". By 1957, Jim's Inn became so popular that Hulton's Television Annual quoted Associated Redifussion's claim that it was now showing signs of rivalling the popularity of long-established favourites on BBC, such as The Archer's and Mrs Dale's Diary. Every week the inhabitants of Wembleham were seen going about their business and relaxing in each other's company. 'The fun is fast and furious' it claimed. Jimmy Hanley was very much at home in this programme-he ran a country pub of his own in real life. When required the village could even be expanded to accommodate different products like the case where a river had to be invented in order to attract visitors for fishing-so one episode could be devoted to the angler. 'There was to be just fifty coats in the sale, and the presentation problem - how to convey all the information in fifteen seconds - seemed very difficult. The solution was for Roma (who ran the local beauty salon) to throw open the door of the pub while the four male characters gave a low whistle. Maggie then said, "What a lovely coat! Where did you get it?" The shows went out live for the first few years and often the actors had little time to learn their scripts, and so a huge glass ashtray was put on the bar under which information on more complicated products was placed. Michael Westmore, Joe Garwood and Anstice Shaw were the producers responsible for Associated Redifussion's Ad-Mags. Joe Garwood said it was like producing five first nights a week. Sadly, there are no recordings of Jim's Inn left in the archives, although other 'Ad-Mags' have survived (see bottom of page for an example). Slater's Bazaar starred John Slater, whilst Send for Saunders had as its star playing a concierge in a block of flats. There were also comedy Ad-Mags at the end of the fifties and in For Pete's Sake husband and wife team Janet Brown and Peter Butterworth presented a twenty-minute programme in which they would parody a well-known film. In one particular scene they did a take on The Count of Monte Cristo. Two bearded prisoners are contemplating their escape when one points out that because of their long beards they would be easily recognised once outside the prison. At this point, the other prisoner produces something he smuggled into the cell - a Telefunken cordless electric razor. The advertisement drew 5,000 replies and the company struggled to keep up with demand. Bernard Bresslaw, Clive Dunn and Mario Fabrizi appeared in a comedy Ad-Mag for Harrison Gisbson's department store. The day after the show went out the store noticed a sizable increase in business, but when one customer complained to the managing director about a store of Harrison Gibson's high calibre being associated with such low comedy, the Ad-Mags were summarily cancelled. Not everyone took such high moral ground and Ad-Mags continued to be hugely popular attracting the likes of Marks and Spencer who ran fifteen-minute Ad-Mags to promote their goods. Of Ad-Mags the report stated that "Ad-Mags blur the distinction between programmes and advertisements. In effect characters known to viewers as friendly personalities because they appear in regular programmes endorse, as though they were disinterested parties, the claims of the advertisers. They give the impression of having, on the most sensible homely grounds, decided to recommend this article rather than that." The Committee's second complaint was that these programmes were, in fact, sponsored television, and although they were made by the programme companies 'the impression made on the viewers' was one of sponsorship. Lastly, the Committee felt that Ad-Mags increased the amount of television advertising time by more than was envisaged in the ITA Act. On all these grounds, therefore, the Committee ruled that advertising magazines should be abolished. Jack Tinker acknowledges that for their part the ITA decided only to apply 'a little cosmetic surgery to the unacceptable face of capitalism,' and although the recommendations had not been made law just yet, eleven out of the fifteen Ad-Mags then being run on ITV were dropped within a few months of the reports publication. Only Rediffusion (which made Jim's Inn as well as several other Ad-Mags) decided to wait until Parliament had ruled. With 70% of its viewing audience in favour of Ad-Mags the company's general manager, Tom Brownrigg, lobbied MP's to reconsider. But by the end of the year the ban was made official. As Jo Gable points out "In the introduction to the Pilkington Report the Committee made it clear that it was within its power to recommend ITA completely restructure its television service, possibly doing without advertising revenue altogether. A scapegoat was needed, and with the grand sentiment of 'We're only doing it for your own good' that pervades the report from beginning to end, the Ad-Mags were sent into oblivion." Part 6: A Licence To Print Money? The Pilkington Report and how ITV survived it. Laurence Marcus October 2005. Reference Sources: Reference Sources: The Guiness Book of TV Facts and Feats, The Tuppenny Punch and Judy Show by Jo Gable, The Television Barons by Jack Tinker, ITV: The People's Channel by Simon Cherry. Katie Boyle tests out the latest line in teaware for an early consumer show. Muriel Young is cooking up something with the help of this nice line in Cornishware.